Live music, local beer, and a beautiful setting are a perfect combination for an outdoor summer event! 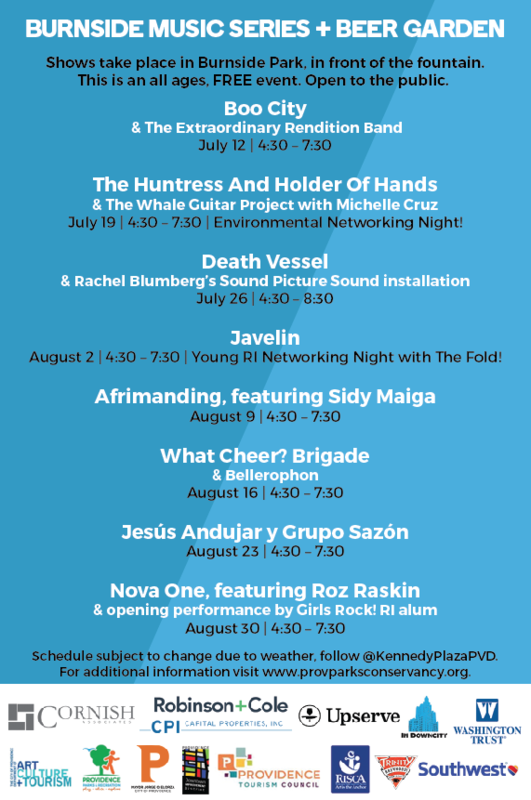 A citywide favorite organized by the Downtown Providence Parks Conservancy, the FREE Burnside Park Music Series + Beer Garden kicks off from 4:30 to 7:30pm on Thursday, July 12th and continues each week through August 30th. Bring your friends, family, and colleagues to the park to listen to an eclectic array of outstanding musicians. Come early to grab a good spot, and enjoy drinks in the Trinity Brewhouse Beer Garden for an hour before the music kicks off at 5:30. During each event, look for different food trucks parked on Washington Street serving dinner. All ages are welcome, but you must be 21+ to drink. In case of heavy rain, follow DPPC on Facebook or Twitter for announcements about postponements or cancellations. Stay tuned for special Night Lights events added after dark throughout the season and into September!